Our Industrial Military epoxy flooring system is primarily used in the toughest floor applications, but can also be used for garage or commercial floors too. Why would you want to use a such a heavy duty floor epoxy? It’s always a good idea to apply a higher duty rated epoxy floor coating than the traffic being applied to the floor. It never hurts to over epoxy a floor, it’s when you apply an under rated epoxy to your floor that always leads to trouble. Our primer is a high performance industrial flooring epoxy based coating that is designed to penetrate into the pores of your concrete floor and provide an inseparable permanent bond to your floor. This epoxy system is as bullet proof an epoxy floor coating as they come. 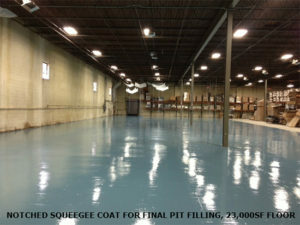 We start off with a high performance solid color epoxy primer/basecoat that soaks in and locks onto your concrete slab. If you stopped right there you would have a better industrial epoxy floor coating than 90% of the other coatings on the market. We follow up on the primer with a solid color super thick 100% solids aliphatic epoxy. We use only the finest epoxy resins, hardeners and pigments we can find to make this epoxy. This results in a beautiful super strong middle layer of your epoxy system. Then we finish it off with our industry best 4mg abrasion loss rated clear topcoat with premium quality nonslip additive. Your three coats bond together into a single 23 mil thick monolithic high gloss surface that is impact resistant, chemical resistant, super abrasion resistant and easy to keep clean. Since we use a clear topcoat you can add color flakes if you like. We do not recommend the use of color flakes on any repair shop floors. Finding small parts on a color flake floor can be difficult! If budget is not an issue this industrial flooring epoxy system is what we would use on any floor; it is that versatile and tough.